Invite some royalty to your garden party this summer. The rose has long been the queen of the summer time garden. Roses have been symbols of love, fame, beauty, war, and celebration and have quite a history. From use as confetti at celebrations to a source for perfume, they “rose” to the occasion in good times and bad. A lady with expensive taste and a love for gardening and roses, Napoleon’s wife Josephine established an extensive collection of roses at Chateau de Malmaison, an estate seven miles west of Paris in the 1800s. While Napoleon was out fighting his battles and making his conquests, Josephine was busy spending his money on the chateau and extensive gardens with a particular interest in roses. He was none too pleased with her floriferous spending habits but you can’t tell me he didn’t appreciate a stroll through the rose garden. No one ever promised you a rose garden, and if some of your previous attempts met their Waterloo you might be hesitant to try them. Maintain your “composture” because help is on the way! Roses today are enjoying a resurgence in popularity specifically shrub, landscape or what we call “own root” roses. Today’s time pressed homeowners are demanding of their landscape plants and roses are no exception. Landscape or shrub roses provide a long season of blooms and color from June to November. Very resistant to disease and problems and loaded with flowers June to November, they have excellent winter hardiness. 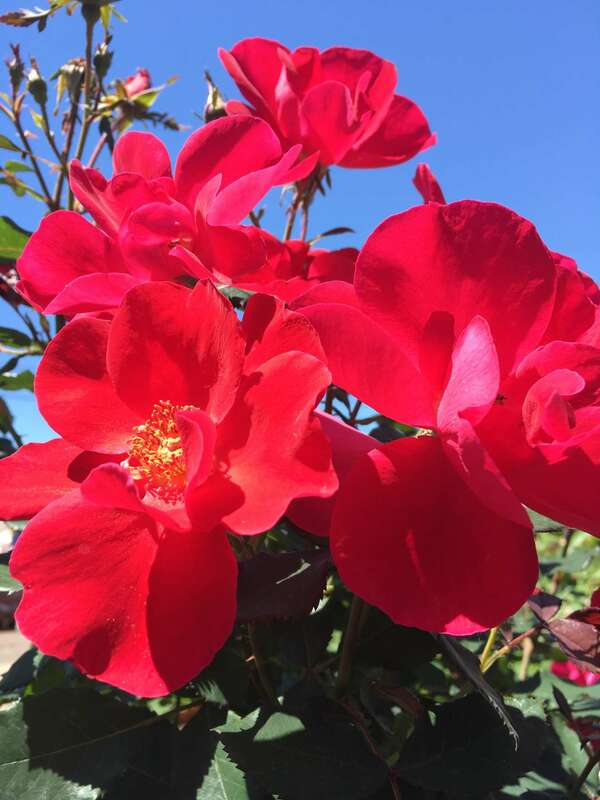 Own-root roses are not grafted so it’s the same plant below the ground as above. They can do what a rose has always wanted to do and that is growing new canes from the root system. Therefore you get many more canes and lots more flowers on a hardy easy to grow plant. Simply put today’s varieties “rose” to the occasion. For true success I recommend you plant them in a good sunny spot. Roses are sun worshippers. A minimum of 6 hours of sun a day or more will work. Shrub roses like any rose bush appreciate morning sun to help dry the foliage. Some attention to the soil will certainly help. Roses are heavy feeders so stay grounded my friend. I like to feed them with a dry feed around the base a few times a year. Rose Tone works well for feeding supplemented with a water soluble feeding now and then. Incorporating organic material into the existing soil at the time of planting is important to improve the structure of your soil and top it off with a one to two inch layer of mulch at the base. When the weather gets hot and sunny this summer they’ll appreciate a soil that has some moisture retention capability and yet well drained. I very “mulch” encourage you to add own root or shrub roses to your landscape. They are not the work laden examples we’ve seen years ago of a few leafless stems with a bloom at the top. They go “Ka-bloom” in the garden and will impress your neighbors and friends. I know you can do it you “rose” to the occasion.